(Bloomberg) -- To experience a real life version of Groundhog Day, walk into Hudson Yards four days in a row. A group of tourists will be camped out just past the revolving doors, blocking your way. At the top of the escalator, the line at the Blue Bottle Coffee will snake down the hall, a monument to caffeine addiction or maybe bad service. The place will be buzzing in the afternoon; after a few hours, it will go dead, and you’ll feel like the person who forgot to leave the party until it was too late. 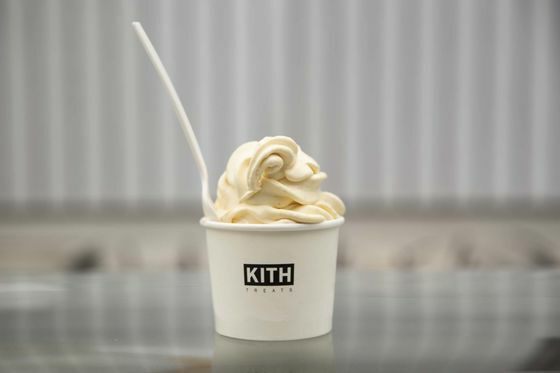 Here then, my top bites and drinks from the best surprises to the biggest disappointments. At the seafood-focused restaurant Mar in Jose Andres’s vibrant market, easily the coolest place in the mall, the best dish doesn’t come from the sea. It’s a special cut from the head of the loin from Spain’s famous acorn-fed pigs. 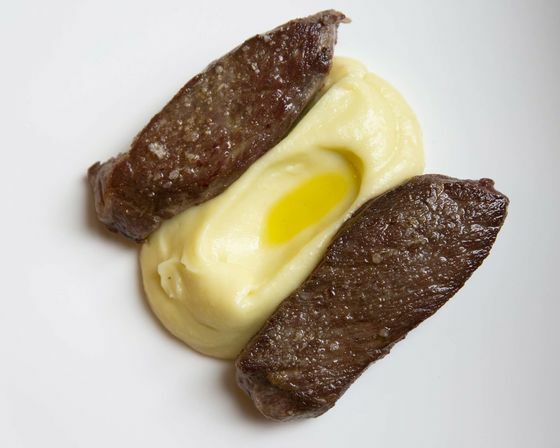 It looks like something from the 1950s: two unassuming thin steaks with a pile of olive oil mashed potatoes. But slice into it, and the pork is terrifically juicy with a deep, nutty chew. The moist, tomato-rubbed bread alongside tastes as if it’s direct from a Barcelona tapas stand. 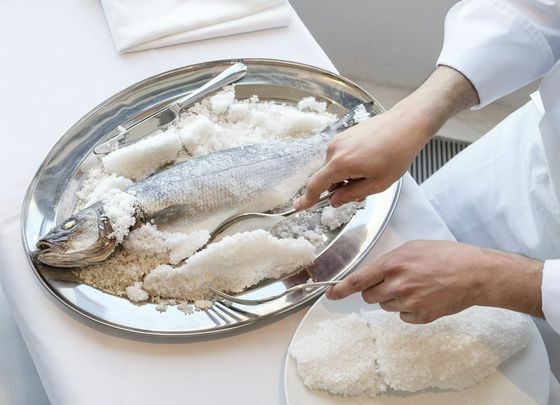 Value is not a concept that’s synonymous with the Milos restaurant group; they’re known for selling fish by the pound equal to some people’s rent. 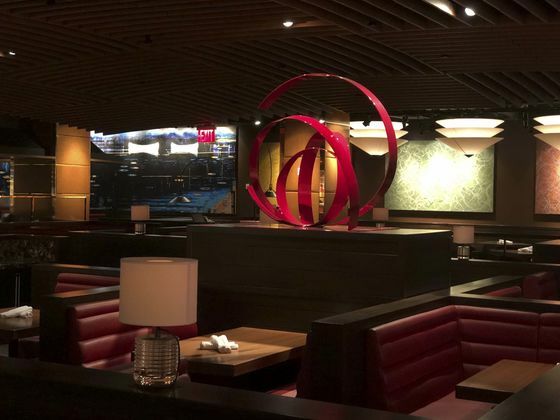 So listen to this: the gyro at their wine bar is Hudson Yards’s best deal. It boasts caramelized lamb slices on top of a supple warm pita the size of a junior frisbee. Topped with a dollop of Milos’s outstanding dense, tangy Greek yogurt, plus tomato and red onion slivers, it costs all of $8. Runner-up: The Greek ceviche, an elegant mix of loup de mer, gigantes beans, feta, and bright fresh herbs. It’s $45 if you order it upstairs—but $10 at the wine bar for a decent-sized portion. Kimbap is, essentially, a Korean sushi roll. At the newest Momofuku, chef Eunjo Park makes a few renditions, including a superior one filled with both tuna belly and loin meat. The rich mix is contrasted by crispy tempura flakes with dried seaweed and a vibrant red dipping sauce made from garlic and both fresno and dried Thai bird chiles. 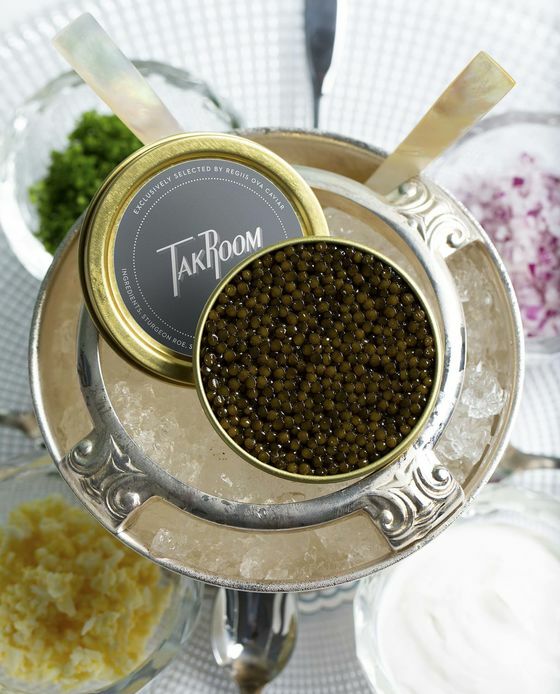 Of course there’s caviar at Thomas Keller’s Mad Men-evoking dining room; the city is awash in it these days. TAK’s conceit is to serve a small tin of the house ossetra with an endless supply of hot, golden potato cakes. The shredded potatoes are drenched in butter before frying; the result is mini-muffin sized, with a crunchy crust and creamy interior. The caviar is market priced (why? It seems like a fixed-price item); the night I was there that meant $150. Still it’s a dish that feels like an event. The place has a lame name and the tag “pan-Asian” cooking. Yet it’s one of the building’s best surprises. 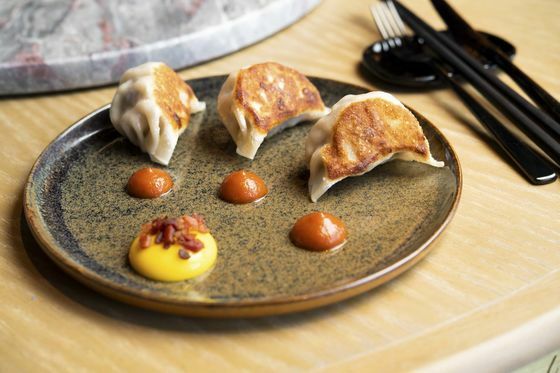 The menu has all-day dim sum, including Crispy Mapo Tofu Dumplings: super juicy, almost like soup dumplings, but stuffed inside golden-fried wrappers and served in a pool of soy vinegar and ginger dipping sauce. The Full English Breakfast dumplings are also delightful, served with an egg yolk and house-made ketchup on the side to smear them through. Both are extra good alongside the spicy charred shishito margarita, a clever pan-Asian take on the classic. Past the entrance of the marble-lined dining room is a dizzying display of gleaming fish on ice and a guy who spritzes them every few minutes. Milkopi is a white-fleshed fish from Greece that the kitchen serves grilled with nothing more than capers and lemon. The only other thing the buttery, flaky fish requires are splashes of Milos’s vaunted bitter olive oil, and there’s a bottle of it on the table. The night I went it was $61 per pound. Passersby think it’s a club, but Snark Park’s white futuristic storefront offers cereal-focused treats, alongside $145 hoodies. There’s a Van Leuween nearby, but for my money, it’s worth waiting on the velvet-roped line for the Ice Cream Swirl, which includes a cereal and topping mixed in. I went with vanilla ice cream, cinnamon crunch cereal, and cookie dough, blended to super creamy and infused with sweet spice and small chocolate chunks. And I’d order it again, every single day. Against the backdrop of heavy bass music mixed with obscure Queen songs, Queensyard has a standout gin & tonic menu. 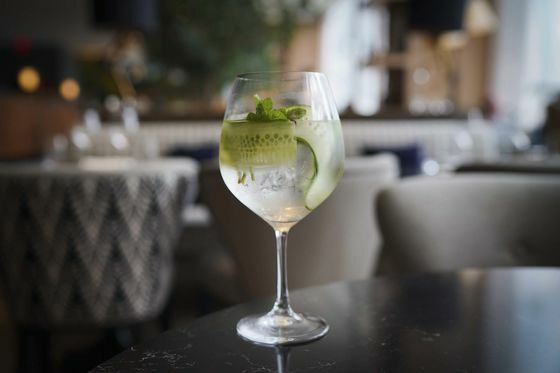 Take the All Rounder, a deceptively simple mix of Hendricks with cucumber, mint, and extra juniper that’s strikingly exotic and refreshing, served in a swimming-pool-sized wine glass. Toto fuses citrusy Inverocche gin with yet more juniper and pomegranate seeds that sparkle in the glass. The burger is a solid accompaniment, better than most of the others served up in the building (more on that in a minute)—a crusty, dry-aged patty topped with sharp melted cheddar and smoky bacon on a griddled bun. David Chang’s Korean version of a Tokyo 7-Eleven has just a few grab-and-go selections. 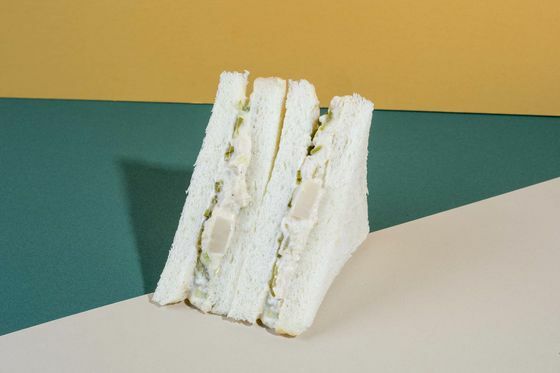 What looks like an elegant, crustless tea sandwich is a stoner’s dream version of potato salad, creamy and punctuated with house-pickled jalapeños and dill pickles between tender milk bread slices. The Peach Mart kiosk also has fried chicken kimbop and assorted flavored Kit Kats and games to play at checkout that might score you a couple of dollars off your bill. 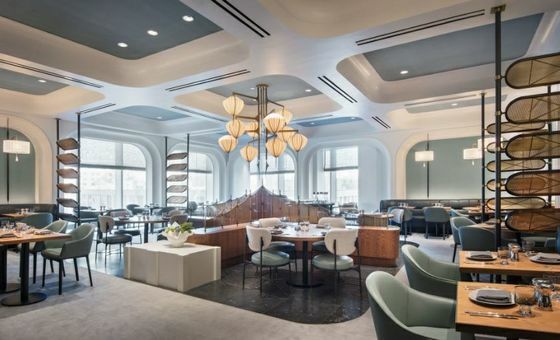 Past a foosball table, tucked into a corner of Hudson Yards’s high-end anchor is this well-behaved lounge. The small menu is a hit list of bar food classics including shrimp cocktail. 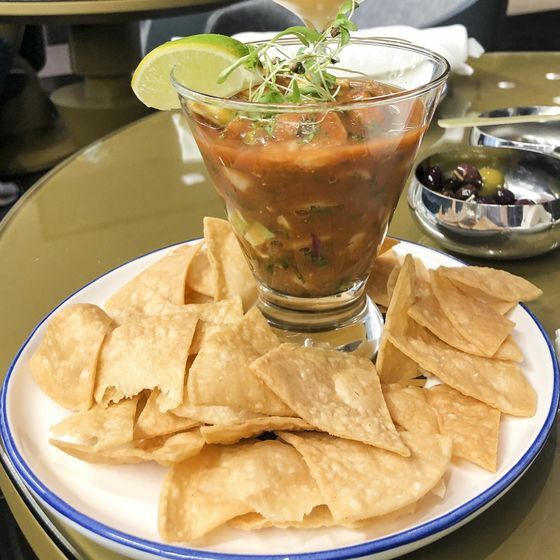 Instead of super-sized, tasteless shellfish clinging to a martini glass, small, sweet shrimp are packed into a thick tomato and coriander salsa, garnished with chopped avocado and served with housemade tortilla chips. It looks a little like someone’s family recipe, but it’s supremely tasty and even at $25, worth it. As a bonus: Cocktails are mixed by leather-apron clad bartenders. Gone Sour is a tangy, elegant mix of pisco, pineapple, and orgeat with a creamy whipped cap made from aquafaba, the chickpea liquid that replicates egg whites. Also in Neiman Marcus, serious time traveling occurs at the spacious main dining room where the menu spotlights customer favorites over the years—which is not necessarily a good thing. Obscenely large popovers are on display under a spotlight at the entrance; fresher ones are handed out to guests. They get boring fast, apart from the accompanying strawberry butter. Also lacking in flavor is the lobster club sandwich. The seafood is surprisingly tasteless, and so is the bacon lining the toast. Also not worth ordering is the lamb burger, which is tough, underseasoned, and overwhelmed by the chewy bun. 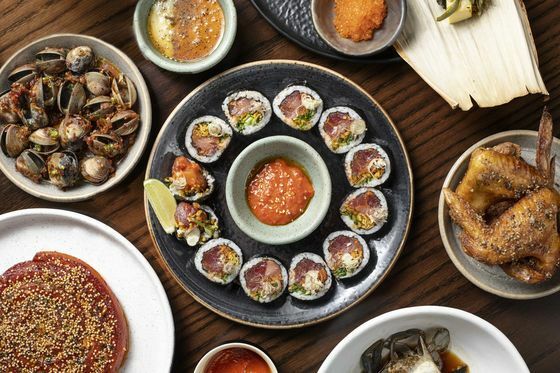 Michael Lomonaco has a wide-ranging menu that includes sushi from chefs who cooked at Masa, a few floors away from his popular Porter House at Columbus Circle. So to be served the kind of roll you might get at an airport with mushy tuna, surrounded by sticky rice that’s too vinegary and a mound of unnecessary wasabi, is rather dispiriting. Insult to injury: if you’re seated near the host station, prepare to be assaulted by the smell of cleaning solution as they wipe down menus. 13. 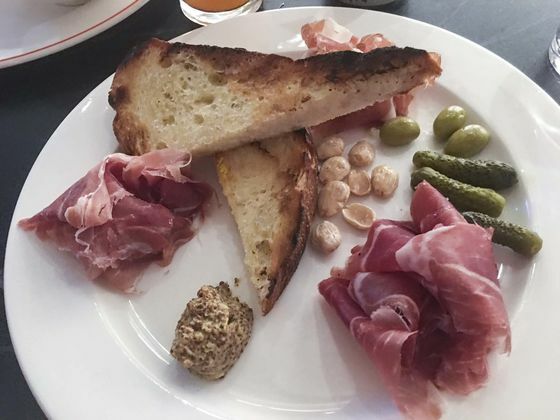 Charcuterie Plate, Belcampo Meat Co.
It’s exciting to have a humanely raised meat expert arrive in New York, and the city should always welcome new charcuterie purveyors. Except perhaps here. Disappointing for a company we’ve previously crowned one of the best butcher shops in America. On a Tuesday night at the crowded Belcampo, the rotating plate of cured meats included uniform slices of coppa that had a weird, funky flavor reminiscent of fish jerky and wildly oversalted spala, or shoulder. The burger, a fixture on every table in the dining room (and one of the best in Los Angeles) arrived well done instead of medium rare, a rather inhumane treatment of already lean grass-fed meat.